"Restaurant Scene" by George Segal, installation at Rutgers University-Camden, Welcome Center. Rutgers University-Camden is welcoming several works of eminent American sculptor George Segal. 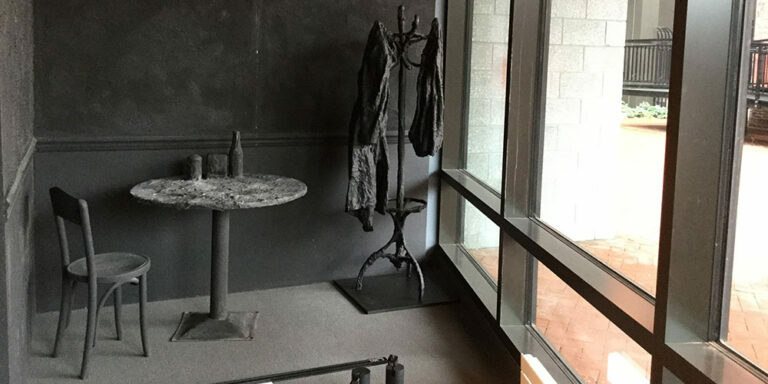 “Restaurant Scene” is now on display in the university's new Welcome Center at 330 Cooper Street, and Robeson Library will welcome a sculpture and several drawings later this summer. The plan is to install “Parking Garage" in the lobby of Robeson Library and to hang several of Segal's drawings in our main seating area, along the wall adjacent to the windows that look over the quad. We are delighted that these exceptional and provocative pieces will be displayed in the Library and can not wait to share photographs of the installation.